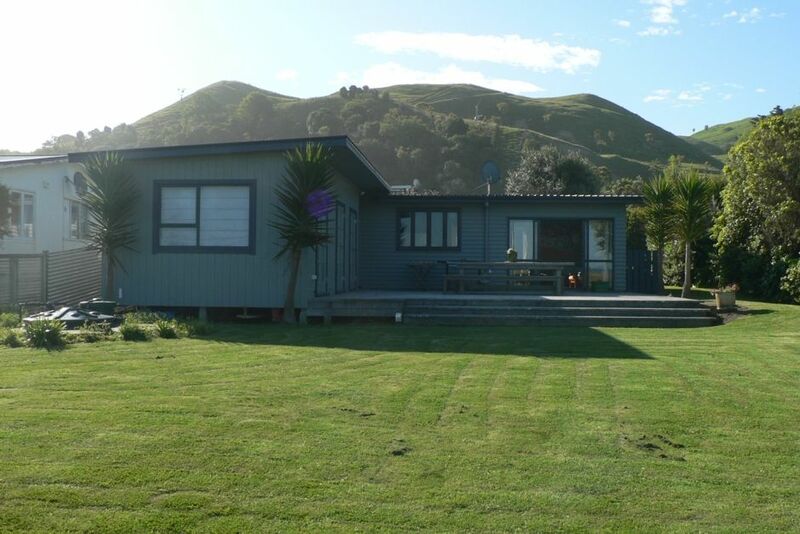 This great kiwiana bach is on the only street at Blachead Beach, 1 of 7 beach front bachs. From the deck enjoy uninterrupted views of the beach. Just step of the deck, walk onto the large front lawn, out through the sand dunes and onto the beach. A gorgeous sweeping beach which includes the Te Angiangi Marine reserve and shoal bay is only a 20 minute stroll up the beach. Blackhead beach offers diving, fishing and surfing with a great right hand point break, that works well on a south easterly swell. The bach is set up for the classic Kiwi beach holiday. There is a wing with 3 bedrooms and a toilet/laundry that open up onto the deck area plus inside the bach is 2 more bedrooms, a shower and seperate toilet and backdoor/storage area. The open plan living space has a large dining table and a comfy sitting area and a kitchen with a view to die for. The living area also opens up onto the deck, making the house an L shape that all leads out onto a very large deck space. The back area of the bach has a concrete paved area which catches the lovely evening sun. The front lawn area is a fabulous large flat space to play family cricket, badminton or whatever you enjoy! Just down the country gravel road (25km) is Porangahau village which boasts a country pub with great food, a local diary for basic supplies and also a good hang out for the sports person with a river to water ski on, a golf course and public tennis courts. Note: There is now telecom mobile access at the top of the blackhead hill but not at the beach. This property is AMAZING!! It is a large bach with 5 rooms all sleeping a min on 2 people easily. Some having bunks and plenty of room for a port-o-cot. The lawn is large with plenty of room for kids and dogs. There is 2 full size fridges which was great for families along with 2 toilets. The view, breathtaking, morning and night! The beach is 1min walk away. An awesome house that I would highly recommend to anyone! We will be back! Fabulous bach with everything we needed for a relaxing weekend away with family and friends. Fabulous bach with everything we needed for a relaxing weekend away with family and friends. We had rain most of the time but had a brief respite which allowed us to explore the beautiful beach right on our doorstep. Enjoyed the isolation, a very special place to chill out and wind down. We didn't realise from studying the online photographs, that there was no internal access for the three bedrooms on the wing. Access to the main house was via the uncovered deck. As it rained all weekend, this became a difficult exercise, made worse by the fact that the locks on two of the three doors were difficult to open. As the house appears to be used regularly by the family, it would help to have separate storage and a fridge/freezer for paying guests. We still had a great time though. Great set up for a beach holiday, especially for an extended group like ours. Great set up for a beach holiday, especially for an extended group like ours. The bach has a lovely homey feel and everything you might need it as hand. The rooms off the deck allow privacy and the deck provides a great central point for meals and socialising. Beach is great for swimming and marine reserve is always interesting. Great location, the house has everything and more, great water pressure, really relaxing and inviting, love the candles and the neighbours are a lovely couple. BBQ great, plenty of space.